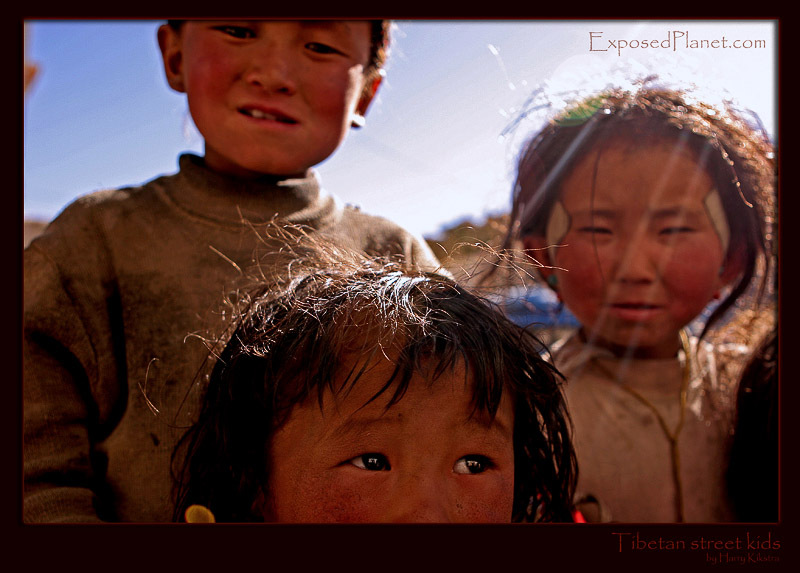 The story behind "Street kids in Taschi Dzom, Tibet"
Taschi Dzom is not much more than a crossroad on the Tibetan plateau. But the one dead end road that forks off here, makes it special as it is the road to Everest BC, Tibet side. Most expeditions and tourists just race through this dusty town as there appears little to do. After acclimatising on the mountain I like to take the climbers back here for a few days of rest at ‘low’ altitude -still 4200m-. As there is nothing to do but sleep eat and walk around you relax, get stronger and ready for the final summit bid. Only after a few days you start to notice that it is nice to walk between the mud houses, talk with the kids and eat in the charming and tasty little restaurants. But it does not matter how skinny and tired you look, for the Tibetan children you are a walking ATM and of course they are correct as the money spent on an average Everest expedition can feed a small family for half a generation. I tried to explain them that my name was Harry, not Money, but didn’t work.. Every now and then I took a picture, without looking at my camera and sometimes it captures the faces of the small Tibetan people, aged by the sun, browned by the dust..